The ease with which ZTE and Huawei modems and data cards are cracked or unlocked depends on the version of USB modem you have. Some are very easy to crack, while others are very stubborn and needs extra efforts to crack especially the new brands like E303 and E173. The essence of unlocking your USB data dongle is to be able to use any SIM card from any network in an initially customized USB modems. The two most popular companies of 3G USB data cards are Huawei and ZTE. This method is the last resort for that ZTE or Huawei modem that been storborn especially those custom USB modems whose firmware are locked their sim company. Download the latest version here. You can also use this DC Unlocker software to unlock mobile phones. One important point you should know is that you need some amount of credit on your DC- unlocker to unlock your device. Don’t be carried away by that crappy stuff regarded as a cracked version of DC-unlocker. You must buy sufficient credit before you can unlock any stubborn modem. The credit varies depending on the device you want to unlock. You can check out the price list from Here. For Huawei E303, it’s only 4 credits while E173 requires 7 credits. You have to create an account on the DC-Unlocker site before you can purchase the credit. Step 1: Ensure you have sufficient credits to your account. Connect your modem and run the software. Be sure you close the default dashboard software for your modem. - Or you can click on the magnifying glass icon to enable the DC-unlocker software to automatically search and detect your device. - It normally takes few second for the software to detect your modem automatically as shown below. Step 2: Now switch over to the right pane of the unlocker and click on Server and fill out the login options text box. Fill it with your username and password, click on check login. Dc-unlocker user name and password is created upon purchase of sufficient credit. You can do that with your PayPal account or with your bank credit card. 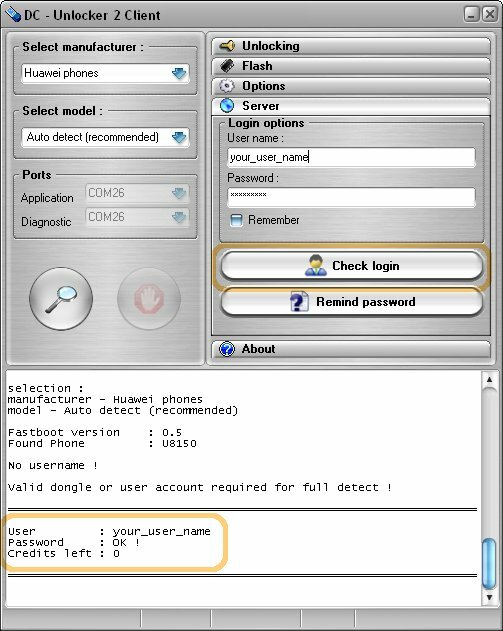 Step3: Click the Do job button and enjoy unrestricted SIM usage on your Zte and Huawei modem You can check out the photo below to see a proof that your stubborn Huawei modem has been unlocked successfully (It works for Zte also). You much have a sufficient balance or credit before you can successfully unlock your modem. 1. Once you have downloaded the software, Double click the software to run it. 2. Now select modem manufacturer and model of your modem. 3. Now enter the IMEI number of your USB modem and click Calculate. 4. It will take few seconds to calculate the unlock code and Flash code. Copy them out. 5. Now insert any other network sim and connect the modem to you pc. It will display a dialogue box where you will paste the Unlock code. Paste the code you initially copied out and click OK. Your USB modem will be permanently unlocked . So you can insert and browse with any SIM card from any network. Most Network SIM companies lock their custom modem firmware so that it will not accept any other SIM card apart from their own network. So for such modems, when you have generated the unlock code and inserted other Network company'S SIM and your USB modem software does not show you the unlock code dialogue box to paste the code. You just have to upgrade your dongle (modem) firmware. Every model has different firmware with different way of upgrading it. Just search on google: your dongle company + model number firmware download. For example Huawei e303 firmware download. Follow the tutorial post from the site you downloaded the upgraded version of your modem firmware. Be very careful and follow the steps as stated because any mistake you make can permanently damage your USB dongle. 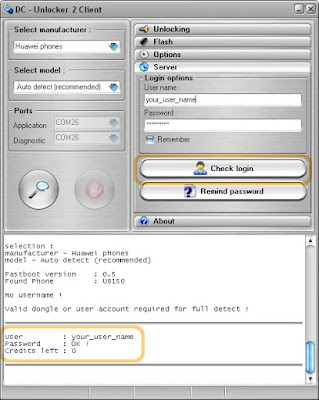 Visit www.modemunlock.com to see special posts and tips for unlocking each version of Huawei USB modem. Are you hooked up anywhere in this tutorial? Comment in the comment box section and I will help you out immediately.